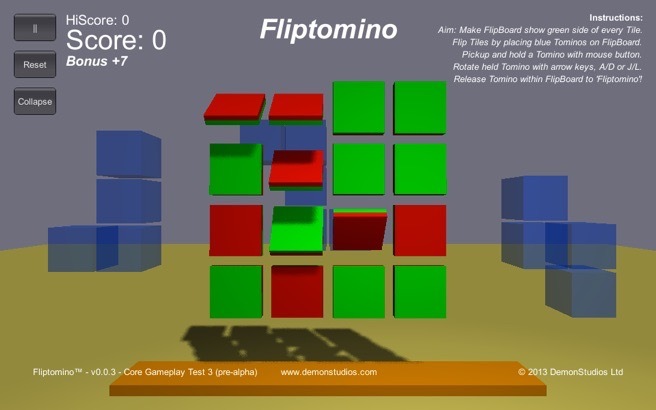 Fliptomino is a fast action tetromino shape puzzler, where the aim is to clear a grid of tiles by flipping them in the variety of different shapes provided. Click the image above to play an early test build right on the website. Uses WebGL so no plug-in required! This is just a work-in-progress core gameplay test / proof of concept demo. It does not represent the quality of the final game! The scoring is bobbins and there’s not much actual game as of yet, all the graphics are just placeholders, and there is no sound. But endless mode is here with 3 example difficulty levels. Medium difficulty does seem to be in the Goldilocks zone! Hard does seem to be a serious challenge, so the game will for sure feature a fixed puzzle mode of some sort as well as high-score marathon mode. The best thing you can do if you want to support me in making this game or if you just want to speed up development / give it more professional graphics, sound and music is to buy Lead Wars, Super Grav or 3D Spinner. Thanks!